Succumb to the scent of Jean Paul Gaultier Scandal Eau de Parfu, a chypre fragrance for women with addictive honey facets.A symbol of sensuality by day and scandal by night, this playful Eau de Parfum is a perfume dedicated to powerful, strong women. For the first time, Jean Paul Gaultier moves away from his corset dressed torsos and unveils a bottle that’s all about the legs. 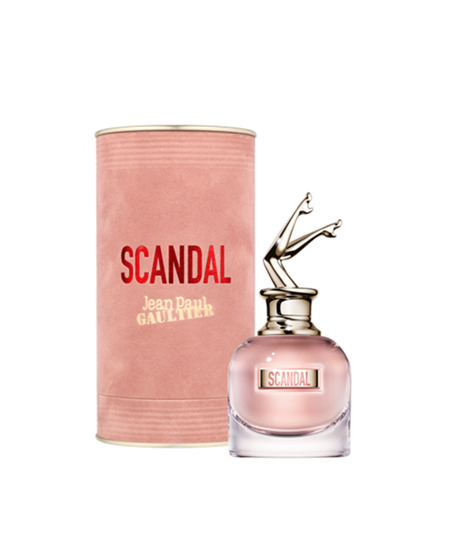 With two beautiful pins skyward in the air, Jean Paul Gaultier Scandal pays homage to the many sides of every woman: her serious persona by day and her mischievous character reserved for nightfall. Scandal opens with a bright and fruity burst of blood orange, its subtle sweetness steering the senses toward a cascade of gardenia petals. The intoxicating character of gardenia gives the composition a sensuous character, which pairs beautifully with the fragrance’s key note: honey. The heart rolls out the red carpet for honey, drawing out its sweet yet deep character by pairing it with the dark tones of patchouli, for a sensuous and inviting signature.